1) Place noodles in a large dish, cover with hot water and allow to soak for 4 minutes. 2) Drain well, cut into pieces and combine with the onions and herbs. 3) Mix together the dressing ingredients. 3) Pour over the cucumber and allow to marinate for 10 minutes. 4) Brush the lamb with oil and season and grill it. 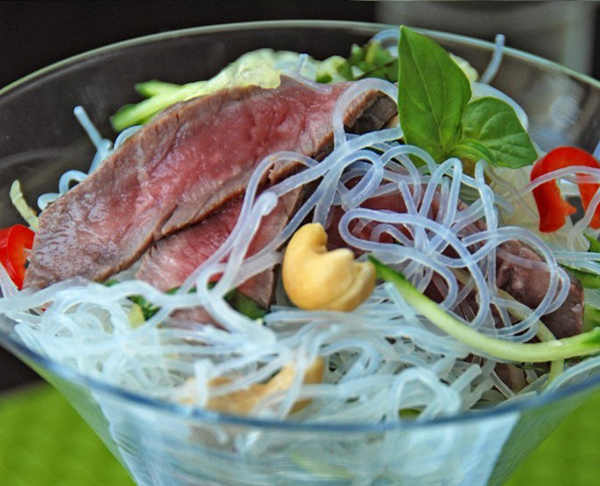 5) Mix the noodles, lamb, cucumber with dressing. Serve into bowls and sprinkle with the nuts.